Teams from Aldwick, Bognor, Selsey, Chi Priory Park, Pagham and Goodwood feature in our latest round-up of the lower divisions of the Sussex League and local village and friendlies. A heavy defeat by 191 runs away to RMU was a big setback to Aldwick’s promotion hopes. It did not look like RMU were going to post a huge total as Ian Horner (3-68) pegged back the home side to 46-2 but with opener Michael Goulding still at the crease big runs were almost inevitable. A recovery of sorts saw Selsey out of that predicament but with support from Bognor’s young and game attack, Adams grabbed 5-26 and Selsey were dismissed for 93, Bognor winning by 133 runs. He eventually fell on 98 to Ollie Smith (2-54), caught behind by Dion Sampson who had a good afternoon behind the stumps. The other Gould brother, George, posted the next highest score of the day, 78. Harry Rosser polished off the tail with 5-21 to bowl out RMU for 301 in the 47th over. It was the first time any team had managed to bowl out RMU his year! Aldwick’s attempt to reach the height’s of RMU’s colossal total soon came off the rails, losing skipper Alex Cooper (5) and John Young (15) cheaply to John Taylor (4-37). Dean Stokes (23) did his best to hold the innings together but wickets fell at regular intervals to Ahmed Nasseri (2-23),George Taylor (2-10) and Scott Kelsey (2-2) as Aldwick were rolled over for just 110 in the 33rd over. Aldwick remain fourth and hope things get better this week at home to Crawley Eagles before they head off for a week’s tour of the New Forest and Dorset. At the Regis Oval, Bognor’s second XI built on last week’s victory to maintain their season. Winning the toss and batting, a fine opening partnership between Mark Woolnough (32) and keeper Charlie Jays (33) gave Bognor a good start. Momentum was gathered with an excellent 57 from Taylor Jaycocks and with contributions all the way down the order, Bognor declared on 226-9. For Selsey, Tom Cripps bagged 4-40 and Peter Horner 3-31. In response burly Bognor seamer Sam Adams went about his business in usual no-nonsense fashion to leave Selsey on 1-3. Aldwick twos are battling hard but until they are in a position to bolster their squad heavy defeats will inevitably occur. Batting first, East Preston posted an insurmountable 266-1 from their 40 overs. Top run scorers were Andrew Shoebridge (48 ret hurt), Andrew Dixon (69), Colin Smith (55*) and Jonny Cooper (81). Aldwick’s sole wicket-taker was Liam Hicks (1-72). With big hitting Ian Guppy in the side, anything was possible and he did not disappoint with five sixes and three fours in a super-quick 46. With good support from Andy Burtenshaw (19) things looked promising but Sam Meadows (6-13) and James Sanderson (3-29) took control and despite brave knocks from Tom Hoare (26) and Liam Hicks (20), Aldwick were 129 runs short on 137 all out in the 30th over. Aldwick go to Goring this week. At Arundel, Pagham won the toss and chose to bat on a ground known for high scores. A double early strike for Bognor saw the initiative with the visitors but a brisk 48 from Jai Patel, 56 from Tam Tran and 97 not out from skipper Dave Luffman saw Pagham finish on 274-7. Similar to the first innings, two early strikes checked Bognor’s reply. But Nick Baker with 56, Glenn West with a crunching 74 and Dan Winslow with 42 kept Bognor in the hunt. A tight finish ensued and with nerves jangling, Pagham edged the contest by five runs, Bognor finishing on 269-9. Chichester scored 205-9 off 40 overs. A well-worked 52 by Steve Price including two magnificent cover drives, and 45 for Caleb Cossar, lifted the visitors after two early dismissals. However, R Hudson and D Bradley were not giving up – Hudson 5-32 and Bradley with three catches – contained Chichester. 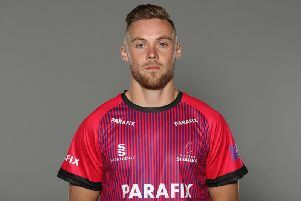 For Clymping Nathan Smart soldiered on as wickets clattered around him – scoring 119 not out with a fine display of shots which outwitted the bowlers efforts. Five sixes and 12 fours helped Clymping win with three balls left. Roger Smith bowled well and Stanley Mayne and Theo Bachelor each took two wickets. Fourteen points for Chichester sees them second in the league. At The Sportsfield, Littlehampton batted first but were restricted by some spirited Bognor bowling. Ben Woolnough took four wickets and a there was rare wicket for Harry Hood. A counter attack from Amjad Mohsin with a century took Littlehampton to 200-9. In response Bognor began steadily and crisp 50s from Tom and Jamie Woolnough saw Bognor to a six-wicket win. In a T20 contest at Worthing, Chippingdale elected to bat first – this looked a good decision as Ella Bourne and Becky Landy helped the hosts to 110-2. For Bognor the zesty Gemma Halford bagged both wickets. Tanya Wake’s team looked in contention with the skipper making 22 and Kate de Lillis retiring but Bognor finished on 95-5, Chips winning by 15 runs. Bognor won the toss and elected to bat. Owen Spicer (3-34) bowled well but Bognor kept the scoreboard ticking over. J Ashmore (68) batted steadily and J Baker (57) and Babs Ahmed (26) also contributed to their score of 211-9. A superb direct hit run out by Matt Bennison broke the bails and fine catches in the deep from Peter Lamb and Jamie Miles kept the run rate down but some late runs from the lower order meant Bognor set a solid target. Tim Pitman (1-19), John Clifton (2-29), Hari Daggubati (1-44) and Jamie Miles (1-26) all took wickets. Light drizzle that started just before tea persisted throughout much of the Goodwood innings. In challenging conditions Bognor’s bowling and fielding was tight and early breakthroughs put them on top. A tidy contribution by Matt Beard (33) and a patient knock by Matt Bennison (85) brought Goodwood back into it. Clifton (32) supported Bennison as Goodwood moved towards theitarget. With Goodwood needing 24 to win off four overs Bognor upped their game. Bennison and Clifton fell in quick succession and in a tight finish Bognor won by five runs.